Sewer Problems? We Can Repair It! If your Watsonville home is having sewer problems, don’t panic! Give us a call at Rosenthal and we’ll send out one of our skilled plumbers to figure out what needs to be done. Sewer repairs may feel overwhelming and frustrating, but the truth is that you don’t need to worry! We are experts and we will get the job done before you know it. Sometimes, it’s pretty obvious that your sewer needs work. Some signs of sewer problems are harder to see, though. Here are a few things to look for if you’re wondering whether you need a sewer repair soon. Extra growth in your yard. If there are one or two places where the grass or other plants seem to grow really well in your yard, you could have a sewer problem. When sewers leak, the sewage helps plants grow better. If your pipe is leaking under your yard, this can look like one or two places where everything grows better that it does elsewhere. Wet spots in your yard. Everyone has areas in their yards where water pools from sprinklers and rain, but if your yard is inexplicably wet somewhere, have your sewer looked at. Part of what drains out of your sewer is liquid, and when it comes to the surface it can cause excessive dampness in certain areas. Several plumbing problems at once. When sewers back up, sometimes your house plumbing will work oddly. Running your washing machine might cause your toilet to overflow, or you might find that all of your drains stop working at the same time. If you’re having unusual and unexplained plumbing problems, the answers might be in your sewer. A pervasive sewage smell. When sewers back up, it’s not just liquid and solid waste that you have to worry about, but gases, too. These cause the unpleasant smells that you generally associate with sewage. If your sewage can’t escape, the gases can’t, either. Sometimes, they travel back up the pipes and into your home, causing an unpleasant smell. 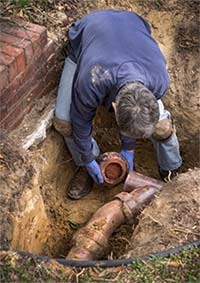 Some homeowners worry about having their yards and landscaping torn up if their home requires a sewer repair. With the latest technology, utilized by Rosenthal, this is a thing of the past. We don’t have to dig up your yard to replace your sewer, anymore. When you call Rosenthal to take care of your Watsonville sewer problem, you can rest assured that you are getting some of the best plumbers in the business. Our people are experienced at dealing with sewer problems, no matter how big or how small. Let us handle the stress of fixing your sewer so you can get on with your life.